Hundred More Years, is the second highly anticipated album from the Dove award winning artist Francesca Battistelli. It has been about a two and half year wait since her first album, My Paper Heart, and yes it has definitely been worth the wait. During that time Francesca has got married and had a baby boy, both of which she draws inspiration from for Hundred More Years, both throughout the album and the title track. Read More Hundred More Years, is the second highly anticipated album from the Dove award winning artist Francesca Battistelli. It has been about a two and half year wait since her first album, My Paper Heart, and yes it has definitely been worth the wait. During that time Francesca has got married and had a baby boy, both of which she draws inspiration from for Hundred More Years, both throughout the album and the title track. Francesca has matured both lyrically and vocally and this shows and strengthens her style of upbeat, encouraging, soul, pop, R&B sound, along with her inspiring lyrics which come from the situations in her life. A lot of people will be able to relate to the songs, especially the very catchy song This Is The Stuff, about loosing keys, getting speeding tickets, and the stuff that drives us crazy but sometimes we forget how much we are blessed. With a threading theme of love, grace and mercy, I could talk about every song on this album. All the tracks will put a smile on your face, you'll be singing along to them all, which can relate and encourage and most of all focus you on the One who loves you, who hung the stars in space for you, our saviour, Jesus. 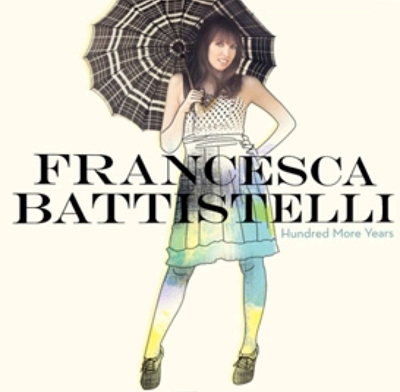 Hundred More Years sounds as fresh as Francesca's first album, and like her first this is uplifting and enjoyable. It's infectious and will have you hooked right from the beginning to the end, you will be left wanting to play it over and over again.